This map represents the groups of landscapes with similar nature protecting (ecological) functions [Polikarpov et al., 1980, p. 184-194]. They are divided into groups depending on these functions: environment-forming function of geospheric and regional significance, environment-regulating, environment-stabilising, and environment-protective. The landscapes of goletz, tundra and sparse wood perform the main environment-forming “water-production” function. Of special significance is their snow and water collecting function. These landscapes experience large hydrological loads as they transform the water and transfer it to the subsurface flow. To date, the production of pure water is the most important ecological function as pure water is becoming the most valuable product on the planet. The significance of these landscapes increases due to the protection of depth and purity of Lake Baikal waters. The environment-stabilizing function is characteristic of all mountain-taiga (moss) landscapes of reduced and limited development – from mountain-taiga shrub-moss dark coniferous and larch communities to shrub and moss-shrub dark coniferous and larch-taiga landscapes in the intermountain depression and valleys with yernik and mixed undergrowth. Their moss cover provides certain ecological conditions. These landscapes are more stable and after external pressure they, as a rule, recover fast. Together with goletz and upper-taiga landscapes, they determine the fundamental set of mechanisms of internal and external interactions of landscapes. South Siberian and Central Asian (Daurian-Mongolian) steppe landscapes are referred to the group with environment-regulating functions. On the whole, they are characterized by insufficient wetness [Geosystems …, 1991; Eco-geographic …, 1996]. Their role in the flow regulation is rather small. However, under conditions of intense water evaporation they have a very important regulating significance: plant components of these landscapes support the existing ecological balance whose changes can cause the disturbance of the moisture regime and, as a result, the landscape structure. This function specifically intensifies under the conditions of anthropogenic pressure. As a result, all steppe landscapes share high soil-protective significance as they fulfil a technogenic barrier function. “Herb” landscapes perform environment-protective function: mountain-taiga larch landscapes of optimal development, piedmont and larch-taiga landscapes of optimal development in intermountain depressions, piedmont sub-taiga larch, mountain-taiga pinewood, piedmont sub-taiga pinewood landscapes. Insufficient moistening is characteristic of these landscapes, and changes of their vegetative component can cause changes in hydrological regime towards aridity and, as a result, disruption of landscape structure. Their water and soil-protective role increases. They are characterised by high concentration of different economic activity. Therefore, these landscapes are of technogenic barrier significance. Atlas of Irkutsk Oblast: Ecological Conditions for Development. (2004) – M. – Irkutsk,. 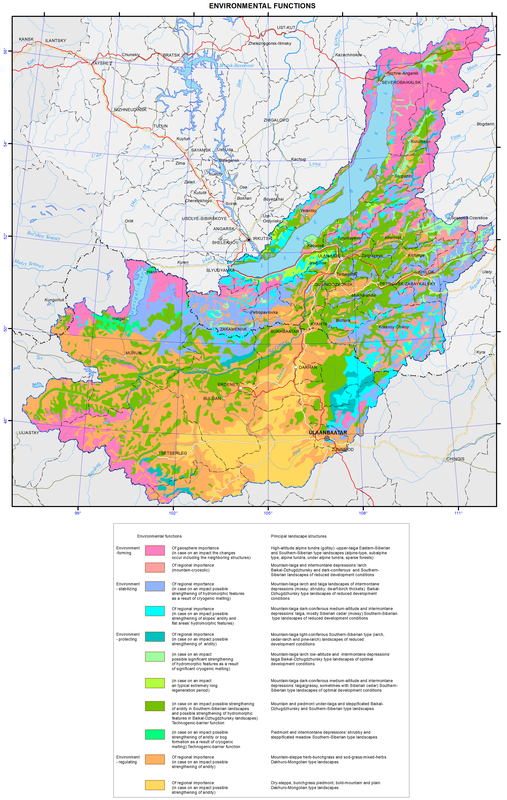 – 90 p.
Geosystems of taiga and steppe contact: South of Central Siberia. (1991) / Chief Ed. A. Krauklis. – Novosibirsk: Nauka. – 214 p.
Isachenko, A.G. (1990). Intensity of functioning and productivity of geosystems // Izv. AS USSR. Ser. Geogr.– 5. – P. 5-17. Correlation eco-phytocoenotic map, scale 1:7,500,000. (1977). / Buks I.I., Baiborodin V.N., Timirbaeva L.S. // Eco-phytocoenotic complexes of Asian Russia (mapping experience). – Irkutsk. Landscapes of South-East Siberia: map, scale 1:1,500,000 (1977). / Mikheev, V.S., Ryashin, V.A. – M.: GUGK, – 4 p.
Mikheev, V.C. (1987). Landscape and geographic supply of Siberian complex problems. – Novosibirsk: Nauka. Sib. Depart. – 205 p.
Mikheev, V.C. (1988). Materials for territorial complex scheme of nature protection (TerKSOP). – Irkutsk. – 63 p.
National Atlas of Mongolian People’s Republic. (1990). Ulan-Bator-Moscow. – 144 p.
Polikarpov, N.P.,. Chebakova, N.M, Nazimova, D.I. (1980). Climate and mountain forests of South Siberia. – Novosibirsk: Nauka. – 225 p.
Sochava, V.B. (2005). Theoretical and applied geography. Selected Proceedings / V.B. Sochava. – Novosibirsk: Nauka. – 288 p.
Eco-geographic map of the Russian Federation: map, scale 1:4,000,000. (1996). – M.: Fed. Service of Geodesy and Cartography of Russia. – 4 p.